DynaMesh gives you the power to create and experiment without any constraints. Starting from a sphere to create a character head is easy but DynaMesh will allow you to create a whole character from that very same sphere with no uneven geometry! Consider what it’s like to work with clay. As you stretch clay out or add volume to it, the clay itself retains the same basic consistency and has the same capacity for detail across its surface. DynaMesh brings that experience to the digital world. You can even add other meshes to your model or use them to cut away portions. The possibilities are only limited by your imagination! When you’re working with DynaMesh, remember to Ctrl+click+drag the background every so often. This will update your model and keep it optimized. From left to right: the original model, some strips of clay added with the ClayBuildup brush with a DynaMesh update using Ctrl+ drag, and then more shapes added and updated several times through the DynaMesh. In ZBrushCore you can increase the number of polygons a mesh contains so that you can add fine detail. This is called Subdivision model­ing. ZBrushCore offers an additional powerful feature through Subdivision Levels. Each time a polymesh is divided the previous levels are kept so that you can go back to them. This is very useful if you want to make major changes to a model, such as changing the shape of a character’s head. You can make the changes at the lowest subdivision level without losing the fine detail at the higher levels. From left to right, the same model with two different levels of subdivision. Notice that at a lower level, we can work on the basic shape of the model while at a higher level, we can work on the details. ZSpheres are an advanced ZBrushCore tool that permit ‘sketching out’ a 3D model (particularly an organic one) quickly and easily, a bit like building a skeleton. 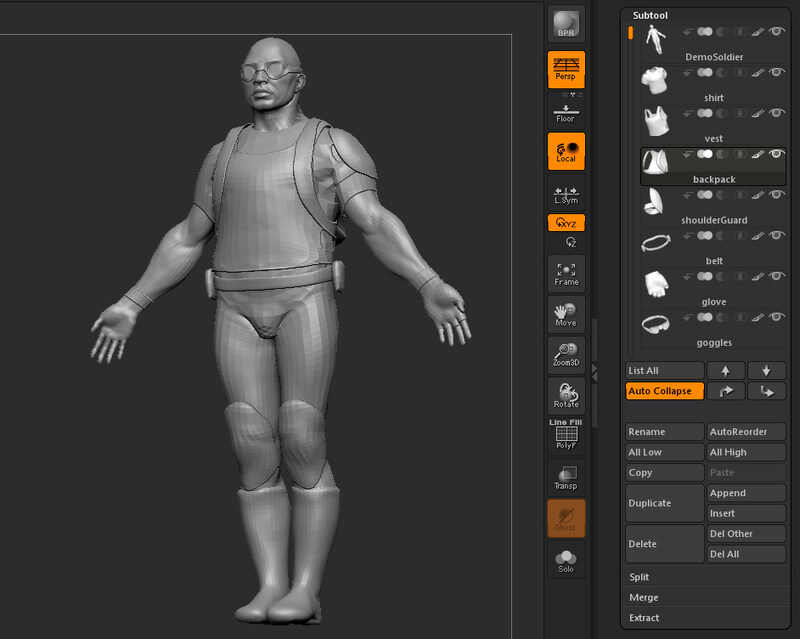 Once the model has been formed using ZSpheres, it can be ‘skinned’ – this creates a 3D mesh for further sculpting. There’s nothing like ZSpheres in other 3D programs, and the only way to learn their ins and outs is through experience. By pressing the “A” key or pressing the Tool >> Adaptive Skin >> Preview button, you will create a preview of the 3D mesh. When you are ready to sculpt, simply press the Make Adaptive Skin button to create an editable model based on the ZSpheres. On the left, the ZSphere model and on the right, the Adaptive Skin preview. SubTools are a way to split your model into separate parts. This can have performance benefits. Also, SubTools are a good way to construct a model that would naturally be made up of separate parts. So for example, for a character model the body could be one SubTool and the clothes other SubTools. Using SubTools means that it is easy to work on one piece at a time. It also makes best use of your computer’s resources. Individual SubTools can be hidden while you work so that you can concentrate on one thing at a time. There is also Solo Mode which auto­matically hides all but the selected SubTool. On the left, the 3D model and its different parts. On the right the SubTool sub-palette and all the individual 3D meshes. Mesh extraction is a fast and powerful way to create new parts for your model. Using existing geometry, you can quickly and easily create a jacket, a helmet, gloves or whatever else your character may need! Mesh Extraction works by duplicating part of the mesh, cleaning the edges to create a smooth, even boundary and also adding thickness (if this is required). The area that is used for extraction can be defined by masking or by hiding the other parts of the mesh. From left to right: the original model with the Mask, the preview of the Mesh Extract and the resulting SubTool.